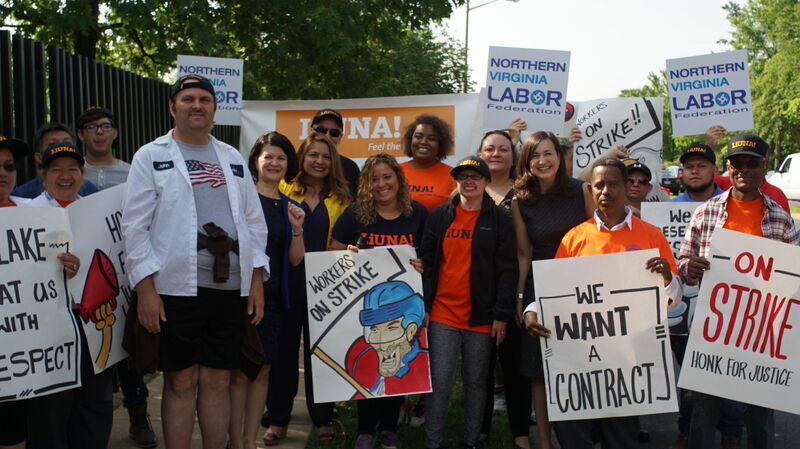 Arlington, Va. (June 7, 2018)– Today, local elected officials and community leaders visited Didlake workers who have been on strike for nearly two weeks outside the Army National Guard Readiness Center in Arlington. Leaders included: State Senator Barbara Favola of the 31stdistrict, State Delegate Elizabeth Guzman of the 31stdistrict, Arlington County Board Chair Katie Cristol, and Director of Virginia CASA de Virginia, Michelle LaRue. The workers, many of whom are disabled, chose to strike after Didlake refused to recognize their union after a majority voted in April 2017 to unionize, and also refused to bargain over their pay and health insurance. Didlake also has appealed the National Labor Relations Board rulings in favor of the Didlake workers. “I’m proud to be standing with so many people who care so deeply about dignity, respect, and the ability to sit down with your employer and ask for good pay, benefits, and acknowledgement of the value you add to our communities,” said Favola. As the leaders stood side-by-side with workers outside the gates of the National Guard in Arlington, they talked to the workers and heard their stories. When the workers voted to unionize, they selected Public Service Employees Local Union 572, an affiliate of the Laborers’ International Union of North America (LIUNA). Two supportive local organizations, The Northern Virginia Labor Federation and Our Revolution Northern Virginia, were also in attendance today. The leaders commended the workers on the example they are setting for other working men and women in the state. “We are here for you and every other worker in Virginia who is supposed to be allowed to organize and fight for their rights,” said LaRue. “We are setting a strong message across Virginia that we are going to fight for the working class and not allow corporations to take advantage of workers anymore,” said Guzman. The workers are asking that the elected officials contact Didlake CEO Donna Hollis and ask that she and her staff sit down with them and come to an agreement.